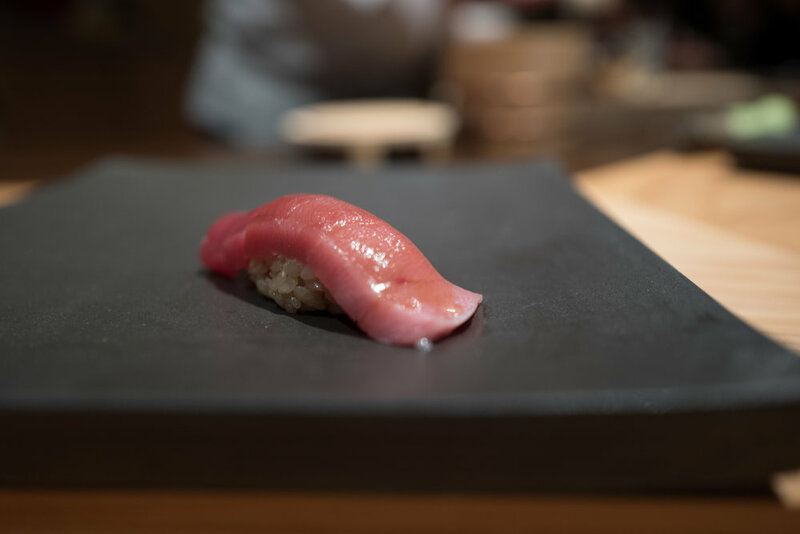 So many new sushi restaurants have opened in San Francisco in the past couple of years (like Omakase, Ju-Ni, or Ijji), but sadly I haven't loved any of them. We've been incredibly lucky in the Bay Area to have the fantastic Sushi Yoshizumi in San Mateo, but in San Francisco proper, really great sushi hasn't been available. I'm happy to say this is no longer the case, thanks to the newly opened Sushi Sasaki! 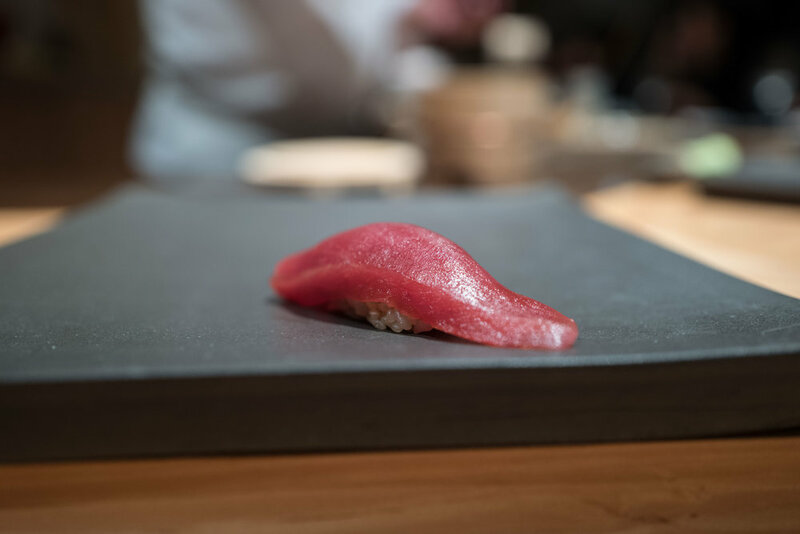 I recently had the pleasure of dining at Sasaki, located in San Francisco's Mission district. Sasaki features not one but two very good sushi chefs: Masaki Sasaki and Takanori Wada. 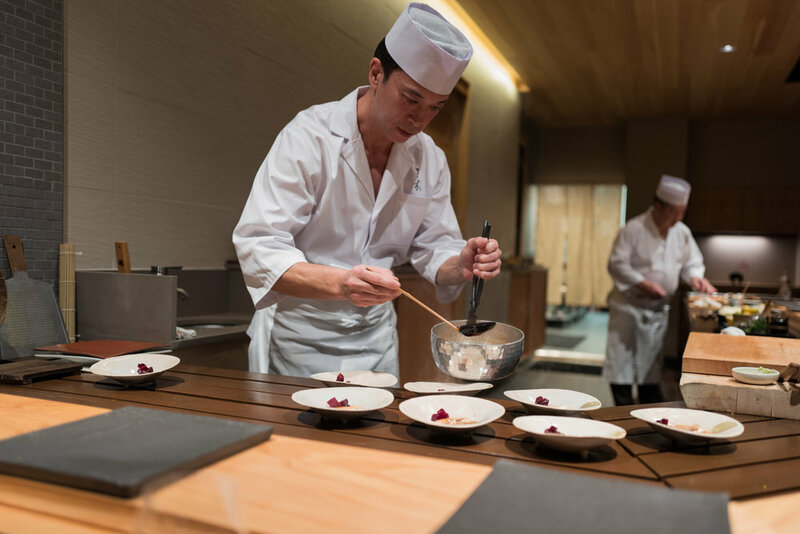 Chef Masa is most famous for his previously Michelin-starred restaurant Maruya, which he left a couple of years ago. Chef Taka has previously worked at Hamano, and most recently at Gintei in San Bruno. 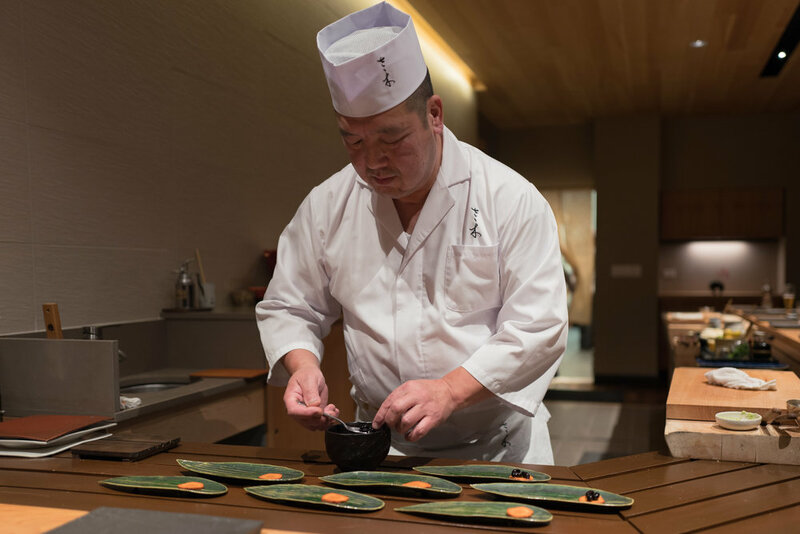 Together, they have fifty years of sushi-making experience, and it shows in the delicious food they offer and in their deep knowledge of Edomae-zushi. The restaurant features a beautiful counter and a very attentive staff who deliver excellent service. The food is delicious, with both otsumami (appetizers) and nigiri featuring high quality ingredients prepared expertly. Sasaki is the only sushiya that I'm aware of in the Bay Area that prepares two batches of rice, each seasoned differently, to best complement whatever tane (sushi topping) is being served - "Sushi Sho" style. This is no small task and it indicates the level of care that the chefs are willing to put in to deliver a great dining experience. The flow of the nigiri courses was definitely unorthodox: chef Sasaki started off with strongly flavored, fatty fish (akami and hikarimono) and akazu (sake lees vinegar) rice, then switched to komezu (rice vinegar seasoned) rice and shiromi (white fish) and other leaner tane, then back to akazu rice in the end. An odd progression, but it worked surprisingly well. The best piece of the night for me was a superb aji - it paired perfectly with the komezu rice and somehow the delicious acidity of the rice really shined with that piece. I have a couple of very minor gripes, and they are due to personal preferences: I think that Sasaki-san's shari to tane ratio is off a little bit. 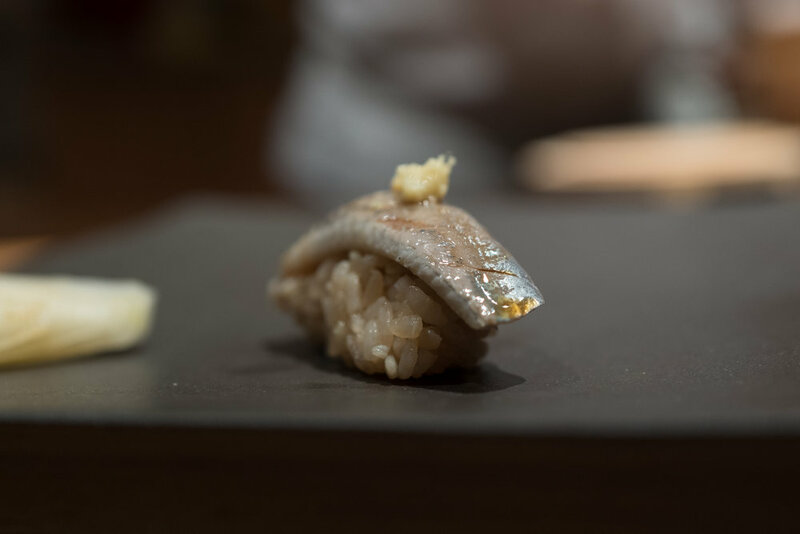 He doesn't always use enough shari when forming the nigiri, and on some pieces it felt as if the balance of the nigiri suffered because of it. I also think the akazu shari could use a little more seasoning and additional sourness. These are minor criticisms that are purely due to my own personal preferences. Overall, the meal was absolutely fantastic. A word to the wise: even though the restaurant has only been open a few weeks, the 12 seats at the counter were completely full on the Friday evening of my visit. I suspect this shop is going to be very hard to book in a few months, and will become even harder to book when it receives a Michelin star next year (which I can pretty much guarantee will happen). So, I highly recommend you try this excellent sushiya while bookings are still fairly easy to obtain. It is, as I've already mentioned, the best sushi shop in San Francisco proper. Currently, the omakase features 3 or 4 otsumami (appetizers) and 14 pieces of nigiri for $180. I spent a little over $300 for the meal, including a couple of delicious Suntory draft beers, plenty of nihonshu, plus tip and tax. Below are some images taken during the evening, along with some additional comments. The beautiful counter at Sasaki, before the beginning of the meal. As is done at Sushi Umi in Tokyo, chu-toro nigiri was served as the first bite of the evening, before any otsumami, presumably to open up one's appetite. An unconventional choice. Very nice pieces of steamed awabi were served as one of the four otsumami. Chef Takanori Wada pouring broth for one of the otsumami dishes. Nice piece of toro, served with akazu flavored rice. Delicious iwashi - notice the brownish tint of the rice due to the akazu seasoning. Chef Masaki Sasaki preparing otsumami plates. Gorgeous piece of fatty buri. In my opinion, a piece like this needed more shari and was ever so slightly out of balance due to the uneven tane (topping) / shari (rice) ratio. Three types of uni served with a tiny bit of sea salt. So good! Good piece of tender sumi ika. Notice that the rice is now completely white - this is due to the switch to komezu (white rice vinegar) seasoned rice. My favorite piece of the night. The sourness of the komezu rice worked so well with the delicious aji. Back to akazu flavored rice, this time for a very nice piece of kohada. Very good anago served with sea salt. Two types of excellent tamago to close out the meal.